Parts One through Three, with the exception of the math (remember math and I don’t get along), all made perfect sense. I felt prepared after the quizzes that end each section to move forward. This section and the next one have some gravity to them. There’s a lot of talk about how things can go very, very wrong if proper safety procedures aren’t followed. It starts, in this section, with discussing the big difference between an automobile and a forklift- the lift steers with the rear wheels. 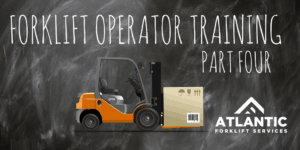 This means the forklift can turn in a tighter radius than a car and as I will write about in my practical (hands-on) portion of the training, this is a significant adjustment for someone who has never experienced this before. There’s talk about emissions and where a gasoline-powered forklift might cause safety issues (common sense), how to avoid obstructions (look up AND down) and maneuvering a forklift on loading docks and in busy warehouses. It’s evident early on that sections four and five are the most important elements of the on-line portion. 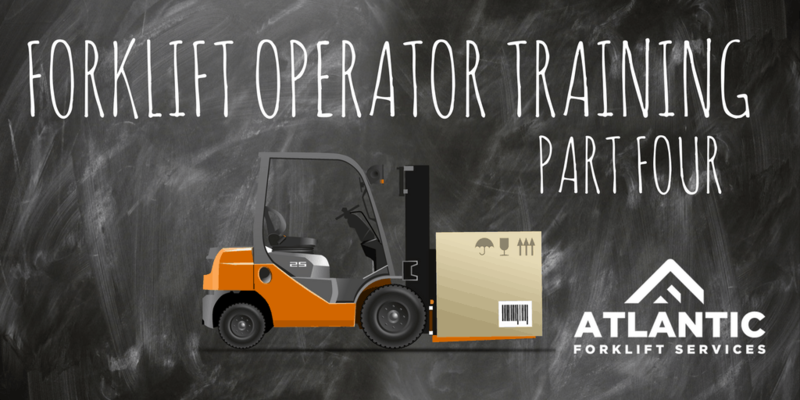 It’s one thing to know how to operate and lift and all that stuff- it’s another to know how to operate a forklift without injuring anyone, or worse- and this chapter of the training really hammers that home. So pay close attention to this section, and the next one- quite literally, someone’s life may depend on it. Another quiz at the end of this section and if you’re like me you were frightened enough about the realities of operating a forklift to really pay attention. I scored 7/7 on the quiz and finished the section in just under 30 minutes. Total time spent so far, about an hour-and-a-half. If you think you may be in the market to learn how to operate a forklift, get in contact with us, we’ll get you started.